If I told you I had the ability to increase your confidence, help you lose weight, help you get stronger, teach you to be comfortable in uncomfortable situations, and introduce you to some incredible people; would you be interested? What if I included improving your ability to defend yourself from a violent attacker? Are you now interested? Still not sure. I’ll add to it by making you a better friend, father, husband, and person. Have I finally got your attention? Great! I have just the thing to help you achieve things you never before thought possible. It’s actually pretty simple. The cure to all that ails you is Brazilian Jiu Jitsu, also know as BJJ. 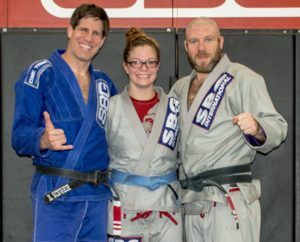 What is BJJ? Simply put, BJJ is a ground based self defense that helps one control an often times stronger and larger opponent by the application of leverage. What differentiates BJJ from the large majority of other martial arts is the application of Aliveness. Aliveness is best defined as non-choreographed training against a resisting opponent. This is where I like to pull out the following football analogy. I have witnessed many of the University of Georgia’s G-Day games. This is where the Offense plays the Defense in a live and refereed scrimmage. Both sides are trying to “win” by imposing their will on the other players. They all play for the same team so there is obviously a large consideration given to safety but pride is on the line; as well as a Steak and Lobster dinner. This is as close to a real football game as you can get. It would look drastically different if both sides of the ball knew what plays the other was running. If the offense told the defense it was running play X, the defense would certainly know to run defense Y. At times that can be very useful and may even be important during the learning phase of the plays. Nevertheless, the way a football team gets better is by learning how to react when things go off script (on either side of the ball). Football isn’t a paint by numbers game, and neither should be your martial arts training. In the vast majority of martial arts people stand in lines, do choreographed dance routines, and memorize one and two step sparring scenarios. I’m reminded of this sketch with Jim Carey on In Living Color. Brazilian Jiu Jitsu evolves, as most things do, because of competition. That competition can be done in the gym against training partners, against strangers in a tournament, or on the street against a violent attacker. 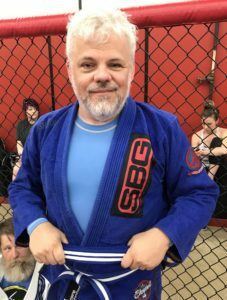 The meritocracy of BJJ provides all the benefits I mentioned at the beginning of this essay and then some. It creates mentally strong men, women, and children. When you find yourself stuck in a bad position you are forced to relax, problem solve, and find success (or be submitted). Just as important is the confidence created is backed up by an actual ability to defend oneself. It’s a win for everyone! If you would like to learn more, fill out the form below and one of our coaches will call you back as soon as possible. This is SBG, you will be okay.